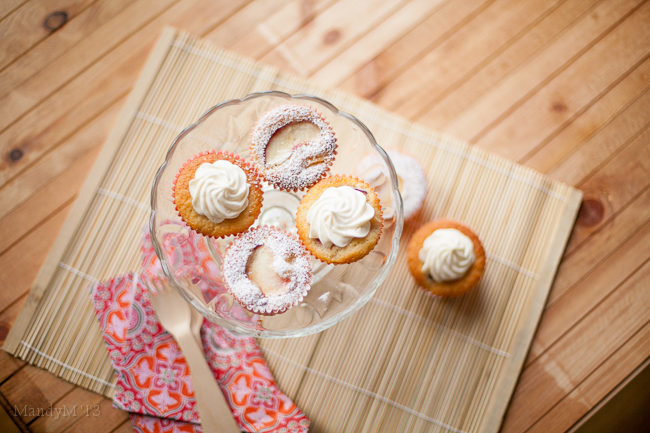 The Great Irish Bake Off & Peach Cupcakes! — What the Fruitcake?! 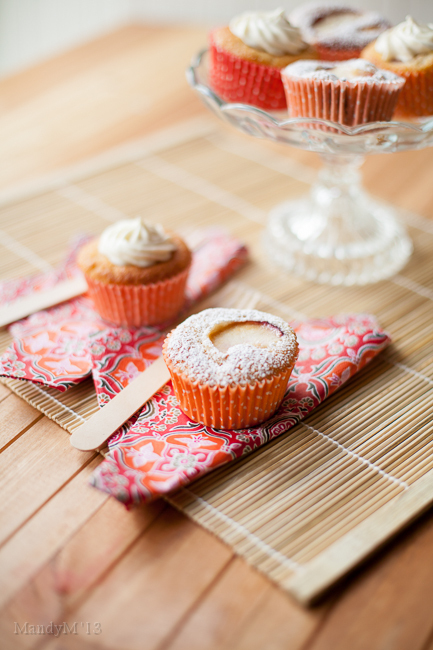 The Great Irish Bake Off & Peach Cupcakes! Some of you may already know that my money supplying day job which finances all my baking madness is as a video editor. For those of you who didn't know this, now you do. I work for TV3 in Ireland, one of the main broadcasters here. Well, because of my job, I hear about upcoming projects and TV programmes that are due to go to air ahead of time. 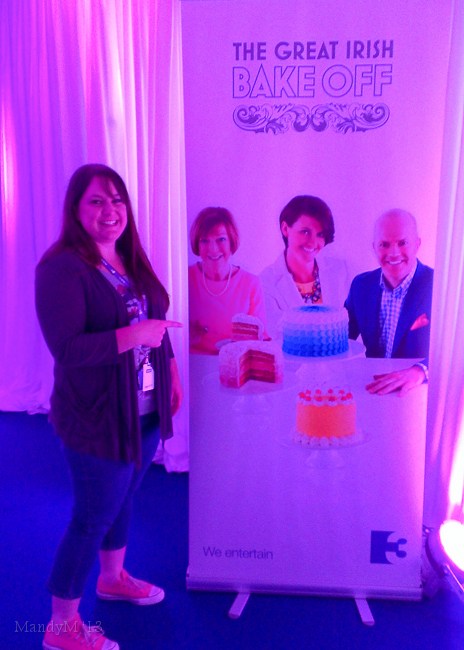 One of the programmes I was most excited about, and if you're a foodie in Ireland were probably feeling the same, was The Great Irish Bake Off. That's right, TV3 bought the rights to produce our very own version of the very popular Great British Bake Off that has taken reality food TV by storm! 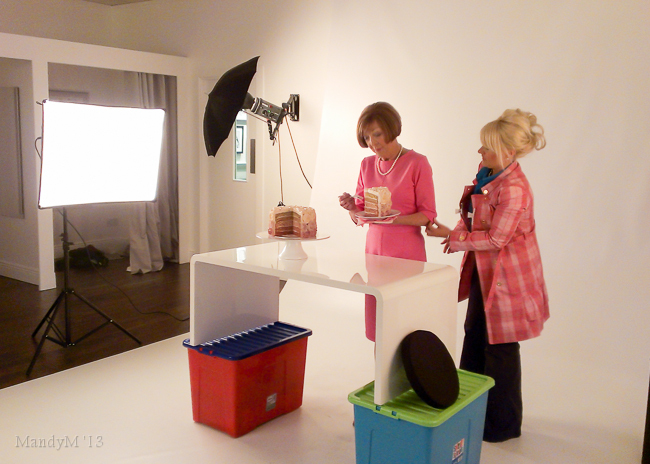 So I was trundling back to my edit suite one day after lunch, and Dave (one of those awesome work people I mentioned), stopped me to ask if, hypothetically, I were to make cakes for the Great Irish Bake Off publicity shoot, what sort of cakes would I do? Is there such thing as a fake cake? etc. So I rambled on about a few designs I thought would look nice and said I'd send a couple of pictures on for them to look at. 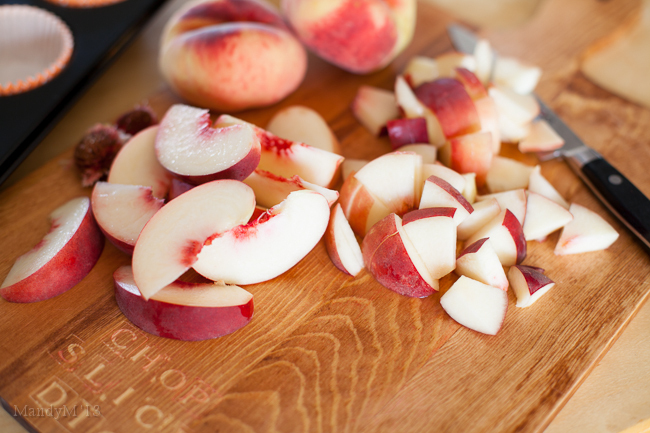 Don't worry, we'll get to the recipe for these babies soon! You probably know where this is going so I'll spare you the details of the lead up to the obvious conclusion. 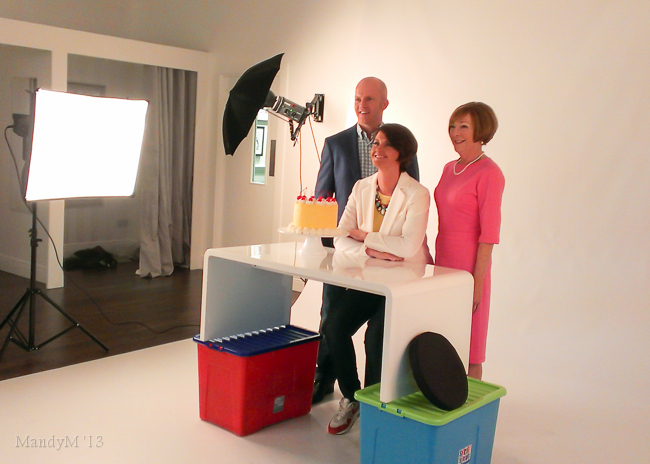 That conclusion being that I was asked to make three cakes for the publicity shoot with the presenter and judges for the Great Irish Bake Off!!! 1 real cake, 2 "fake" cakes i.e. frosted cake dummies. Yellow for Nora, blue for Paul and pink for Biddy. The designs were chosen from some of the pictures I had e-mailed on (links to the original inspiration for each cake is at the bottom of this post). I was seriously excited! And nervous! My cakes were going in front of the judges! I almost felt as though I was a contestant in the show after all. 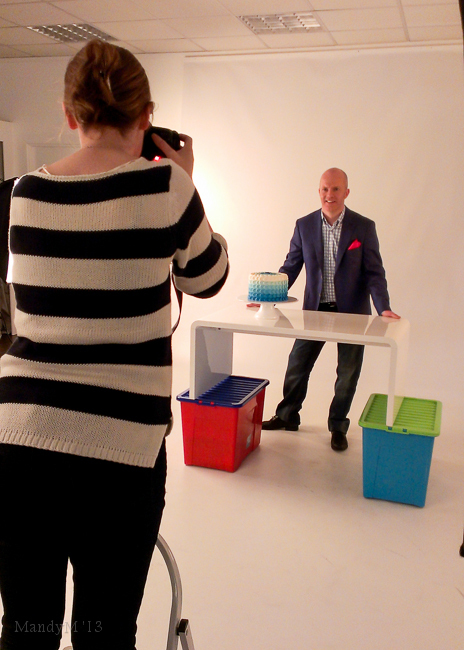 But as soon as I got to the studio and met the judges, all nerves disappeared. Not only did they all love my cakes, they're also really, really lovely too. In between plating cakes and whatnot, everyone had a good laugh and the whole morning was easy going and relaxed. I was seriously thrilled when the Executive Pastry Chef at the Merrion Hotel in Dublin, Paul Kelly, brought over his phone and started showing me photos of baked goodies. I brought mine out and we ended up chatting away about cakes and chocolate plastique and the method for the petal frosted cake I'd brought in. The morning went without a hitch, until the very end. Thank goodness it was at the very end! I was busy packing up and putting the cakes back in their boxes. The dummy cakes were nice and light and were easy to deal with. Then came the real cake. For those of you who have made a six layered cake loaded with frosting, you'll know how heavy they are. They're also somewhat imbalanced when a huge wedge has been cut out. I'm going to be doing a weekly review of each episode, with my own episode inspired recipe included, so if keep an eye out each Thursday after the airing of each show for my blog updates! And yes, they will contain spoilers, so don't say I didn't warn you. 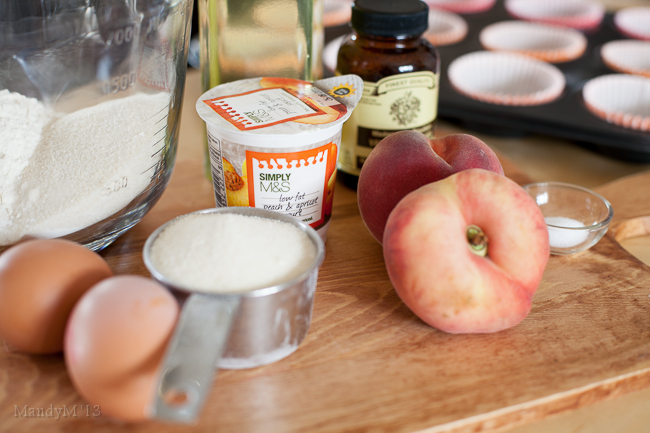 So to start off this #GIBO blog series, a delicious, yet ridiculously easy recipe for moist peach cupcakes. 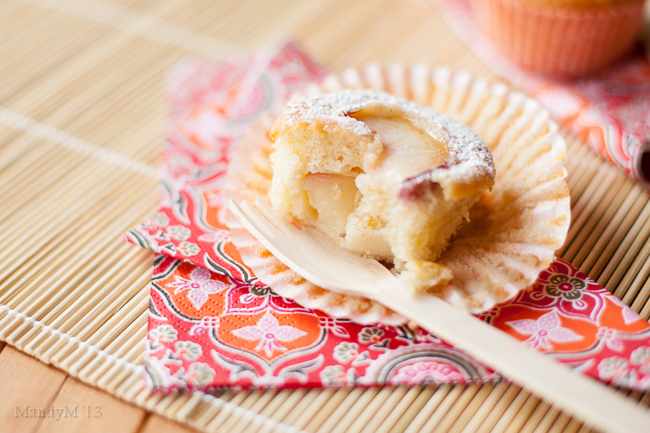 It's based on the recipe that I used for my Apple and Rosemary cake, that is, the very fun "7 Cups Cake". I've done away with the yoghurt tub measuring cup for this recipe, but it's the same principal. 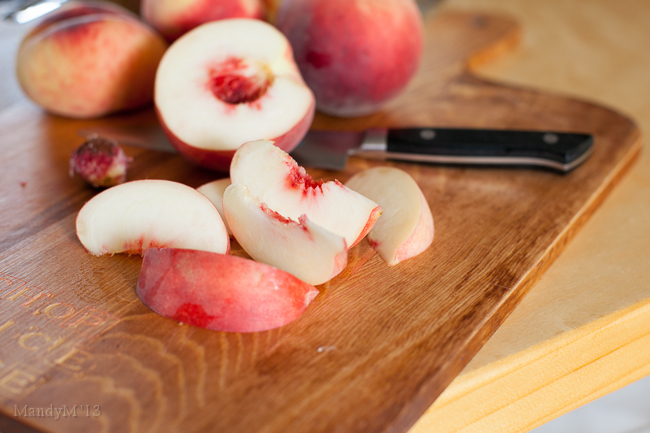 It's moist and light and really deals well with adding juicy fruit and so was perfect with sweet summer peaches baked in. 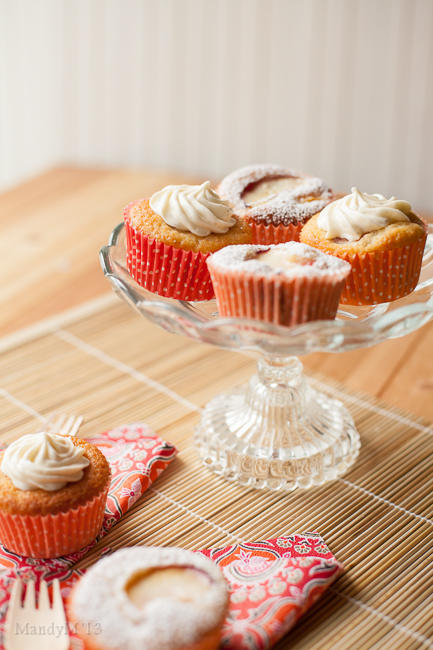 I find that peaches don't have as strong a flavour when baked into cake, so I've topped my cupcakes off with just a small kiss of cream cheese frosting, but in all honesty, these are lovely without any frosting at all and just a dusting of powdered sugar. Whichever way you dress them, they're just amazing. Right, after that long post, here's the recipe! And don't forget, the Great Irish Bake Off will be on Thursdays at 9pm on TV3. The first episode airs on the 19th. Also, check out the TV3 GIBO website, you can get to know the contestants, and they will be posting the actual recipes from each episode. I'll also be tweeting up a storm and posting extra bits and pieces on my Facebook page, so check them out too. 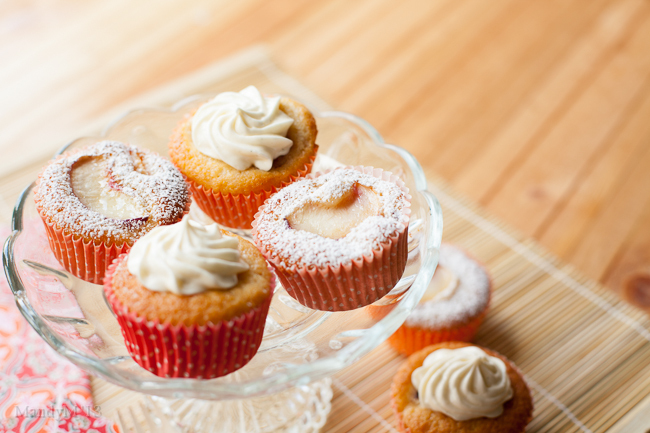 Posted on September 13, 2013 by Mandy Mortimer and filed under GIBO and tagged GIBO Peach Cupcakes Baked Sweet Great Irish Bake Off.